With those five multi-colored rings and Tokyo on every competitive climber’s mind, athletes around the world have been training full throttle for 2020. It’s now just one short year away. It’s game time. With climbing to be included in the Olympic Games for the first time, there have been equal parts excitement and confusion about how athletes will qualify. For U.S. athletes, the first part step is to earn a spot on Team USA. Left to right: Drew Ruana, Sean Bailey, Nathaniel Coleman and Zach Galla. Photo: Jon Glassberg. 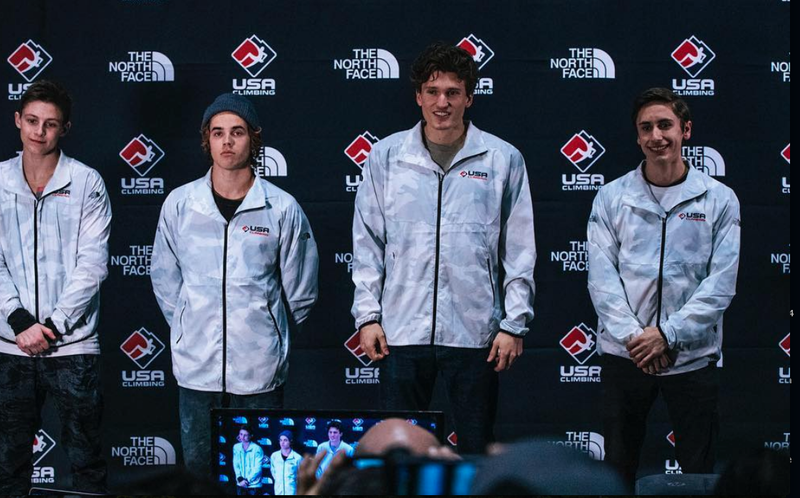 Now, eight athletes—four women and four men—have taken that step and are that much closer to Tokyo.USA Climbing announced on Instagram the members of the U.S. Overall National Team:: Margo Hayes, Brooke Raboutou, Ashima Shiraishi, Kyra Condie, Drew Ruana, Sean Bailey, Nathaniel Coleman and Zach Galla. They will compete on the IFSC (International Federation of Sport Climbing) competition circuit over the next year in hopes of earning one of the 40 (20 for men, 20 for women) spots available for Tokyo 2020. How were these climbers chosen? There were several different avenues by which these athletes earned their spots. The first was to win the Combined Invitational—this is how Kyra Condie and Zach Galla secured their places. Even if you weren’t Condie or Galla, though, your performance still mattered and served as selection criteria, along with how you did in the Bouldering Open National Championships and the Open Sport and Speed National Championships. Brooke Raboutou and Nathaniel Coleman could pride themselves on coming in second place at the Combined, putting them in good standing. Ashima Shiraishi came in fourth for women, and Margo Hayes placed fifth. Sean Bailey put third place under his belt for men, right behind Coleman and Galla, and Drew Ruana came in fifth. At the Bouldering Open National Championships, Ashima Shiraishi topped the podium in first for women, with Margo Hayes in third and Brooke Raboutou coming in fifth. Sean Bailey matched Shiraishi in the men’s competition with an impressive victory. Nathaniel Coleman was right on his heels, in second, Drew Ruana placed third, and Zach Galla rounded out the top four. The Open Sport and Speed National Championships were the final stage before announcing the team. Margo Hayes solidified her spot by winning the women’s lead competition while Ashima Shiraishi came in second, and Kyra Condie landed in third. Brooke Raboutou fought her way to sixth in speed, the trickiest discipline for most lead and bouldering competition climbers. Sean Bailey came in fourth overall for men in the lead competition, and Drew Ruana came in sixth. Come late July, the team will be reformed—though could be the exact same make-up—of the top four men and top four women in the U.S. overall ranking. Although it is not guaranteed that any American climber will qualify for Tokyo, this whittled down, core team formed could produce America’s—and the world’s—first Olympic climbers.